Historian Doris Kearns Goodwin coined the term “Team of Rivals” to describe President Abraham Lincoln’s cabinet, but that was not the only team that Lincoln employed during the Civil War—virtually unknown was his “Team of Mediums.” While it is well known that Mary Lincoln frequently attended Spiritualist séances while living in the White House, historians have insisted that President Lincoln only attended a few séances in an attempt to humor and protect his mentally unstable wife. This narrative is incorrect. Following the death of their beloved son Willie President Abraham Lincoln and his wife became actively involved in the Spiritualist movement and formed friendships with the trance medium Nettie Colburn. To keep Nettie in the capital, Mary Lincoln used her political clout as the President’ wife and arranged for her to be employed as a clerk for the Department of Agriculture. Besides assisting Nettie Colburn in finding employment, Mary Lincoln also assisted Nettie’s brother in receiving his furlough, thus began a pattern of mutual benefits for both the medium and the First Lady which would characterize their relationship. Mary Lincoln was so impressed by Nettie that in late December 1862, the medium received an invitation to come to the White House. “I felt all the natural trepidation of a young girl about to enter the presence of the highest magistrate in our land, being fully impressed with the dignity of his office, and feeling that I was about to meet some superior being; and it was almost with trembling that I entered with my friends the Red Parlor at the White House, at eight evening (December 1862,” Nettie recalled. President Abraham Lincoln was amused by the sight of the petite medium. “Dropping his hand upon my head, he said, in a humorous tone, ‘so this is our ‘little Nellie’ is it, that we heard so much about,” the medium remembered President Lincoln saying. After greeting the President and Mrs. Lincoln, Nettie went into a trance. According to Nettie, the spirits offered the President advice regarding the Emancipation Proclamation. “With the utmost solemnity and force of manner not to abate the terms of the issue, and not to delay its enforcement as a law beyond the opening of the year; and he was assured that it was to be the crowning event of his administration and his life; and that while he was being counseled by strong parties to defer the enforcement of it, hoping to supplant it by other measures and to delay action, he must in no wise heed such counsel, but stand firm to his convictions and fearlessly perform the work and fulfill the mission for which he had been raised up by an overruling Providence,” the spirits advised. And indeed, Nettie would see President Lincoln again. One morning in February 1863, while the medium was staying with the Lauries’ the Spiritualists received a letter from Mary Lincoln that requested their services for the evening. Upon learning the contents of the letter, Nettie became controlled by her spirit guide, a 500-year-old Aztec princess called Pinkie, under the control of the spirit announced that the President would be accompanying his wife. 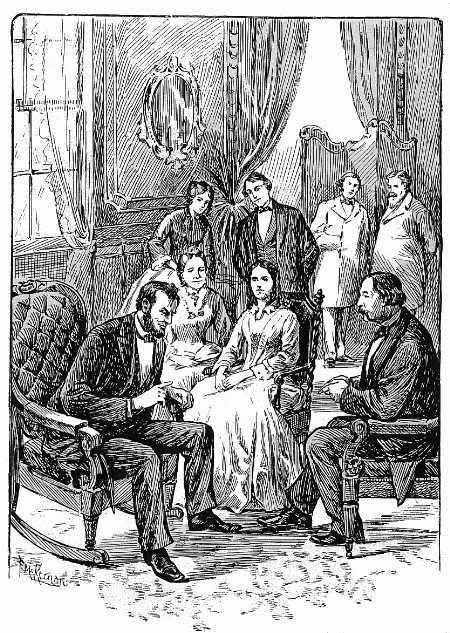 Mr. Laurie rather questioned its accuracy; as he said it would be hardly advisable for President Lincoln to leave the White House to attend a spiritual séance anywhere; and that he did not consider it ‘good policy’ to do so,” Nettie remembered. As part of the evening’s events the spirits communicated with President Lincoln. “I believe that Mr. Lincoln was satisfied and convinced that the communications he received through me were wholly independent of my volition, and in every way superior to any manifestation that could have been given me as a physical being.” As the evening wore on the spirits got frisky and caused a piano to levitate. The séance then concluded, and the Lincolns’ returned to the burdens of the Civil War. “I believe that Mr. Lincoln was satisfied and convinced that the communications he received through me were wholly independent of my own volition, and in every way superior to any manifestation that could have been given me as a physical being,” Nettie declared in her memoir. As the months passed, Mary Lincoln and Nettie Colburn formed a symbiotic relationship dependent on the mediums ability to channel the spirits. An incident that occurred during the Battle of Chancellorsville in May 1863 perfectly illustrated their relationship. Because of the services that Nettie preformed for the Lincolns and was trusted by the First Lady, the medium was granted full access to the White House. This included the freedom to obtain flowers from the White House greenhouse. According to Nettie, one morning, the medium decided to obtain some flowers to bring to her father and brother who were patients at one of the countless military hospitals in the capital. “Intending to visit him, I went by permission of Mrs. Lincoln to the White House hothouse to obtain a bouquet of flowers for him,” Nettie recalled. Arriving at the private entrance of the White House with her friend Parthenia “Parnie” Hannum, the young women expected to be given a pre-cut bouquet. Instead, Nettie found Mrs. Cuthbert, the White House housekeeper waiting for her. 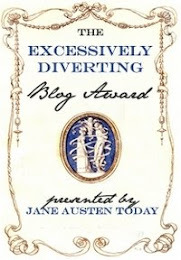 “Oh, my dear young ladies,” Mrs. Cuthbert exclaimed, “the madam is deestracted. Come to her, I beg of you. She wants you very much.” Following the French born housekeeper into the President’s private quarters, Nettie and her friend found the First Lady in her wrapper with her hair down frantically pacing up and down her room. Turning to the medium, Mary Lincoln explained the reason for her distress. The Battle of Chancellorsville was raging and the President had just received a telegram announcing that the Union army was in the process of being destroyed with numerous officers dead. “Will you sit down a few moments and see if you can get anything from ‘beyond?’” the desperate First Lady pleaded. Not wishing to pass up such an opportunity to display her skill, Nettie complied with Mary Lincoln’s request. Nettie then preformed a short séance which calmed Mary’s frayed nerves. Upon the conclusion of Nettie’s impromptu séance, President Lincoln entered his wife’s bedroom. Mary Lincoln was enthusiastic over what Nettie had just done for her and according to the medium, “Mrs. 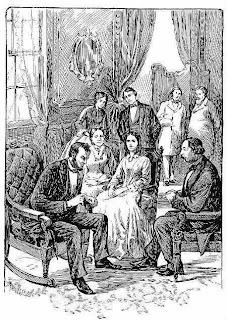 Lincoln instantly began to tell him what had been said.” Seizing the moment, Nettie performed another séance for the benefit of the President and Mrs. Cuthbert. According to the medium the message she relayed to Abraham and Mary Lincoln from the other side brought reassurance that the apocalyptic tone of the telegram had been false. 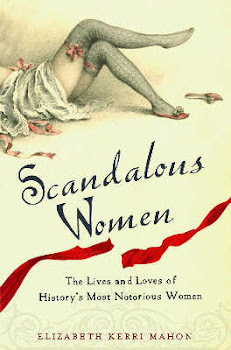 “My friend said she had never seen me more impressive or convincing when under control,” Nettie bragged in her memoir. Grateful for the reassuring message, Mary Lincoln expressed her gratitude by giving the women large bouquets of flowers. “I need not say that our hands were well filled with flowers when we left the White House,” Nettie concluded. This incident illustrated the type of relationship Mary Lincoln had with the medium. Mary Lincoln relayed on Nettie for her skills as a medium and only brought her into the White House to employ Nettie to do a séance for her. Nettie in turn complied with the First Lady’s request due to the material advantages it brought her. Despite remaining discreet, Nettie’s activities in the White House became well known within the Spiritualist community. On October 26, 1863, Abraham Lincoln received a note from his close friend Joshua Speed. Throughout the war Speed made periodic visits to the nation’s capital and it was during one of these visits that he decided to write a letter of introduction for the medium Nettie Colburn and her friend Anna Cosby. “My very good friend Mrs Cosby and Miss Netty Colburn her friend desire an interview with you,” Speed wrote. President Lincoln was already well acquainted with the medium and Anna Cosby. Nettie had just made her acquaintance with Speed in the fall of 1863 upon her return to Washington, D.C. after taking a trip to New York to visit her parents. At the time, Nettie was residing at the home of her friend Anna Cosby whose husband had just lost his position as consul to Switzerland amid accusations of associating with Confederate officials while at his post in Geneva. The medium was concerned that because of her friend’s fall from grace her access to the Lincoln White House would be affected. This would have hurt Nettie’s budding political power. Her access to the President and First Lady had become well known throughout Washington, D.C and people flocked to Nettie to beg her to plead their case with the President. The medium needed to be able to see Lincoln on the behalf of these claimants. One of these petitioners, Colonel Morgan H. Chrysler had summoned Nettie back to the capital from her vacation in New York to aide him in acquiring the command of his brigade. “He had confidence in my power to reach the President, and he had also confidence in the unseen powers that controlled me, and he earnestly requested that I should make the effort in his behalf, offering to defray all expenses, which he did,” Nettie stated. In an attempt to ensure her admittance to the President, Nettie likely asked Joshua Speed to write her a letter of introduction. Joshua Speed, impressed by a séance Nettie Colburn had done for him gladly, performed the task. “It will I am sure be some relief from the tedious round of office seekers to see two such agreeable ladies,” Speed wrote. Joshua Speed was quick to add that they were mediums gushing, “They are both mediums & believe in the spirits—and are I am quite sure very close spirits themselves.” In the postscript, Speed added, “Mrs. Cosby says she is not a medium though I am quite sure she is or should be.” The medium’s concerns were unfounded. Upon her arrival at the White House, she was admitted into the President’s office where Lincoln gave her a friendly welcome. “How do you do, Miss Nettie?—glad to see you back among us,” President Lincoln announced. Though unable to help Nettie, the President appeared happy to see the young medium again and directed her to take the matter to the Secretary of the War. Undeterred, Nettie visited Edwin Stanton and successfully persuaded the cantankerous Secretary to grant her request. Throughout 1864 Mary Lincoln continued to summon Nettie and her Spiritualists friends to the White House. Shortly after Nettie’s public lecture, the medium was invited to the White House to show off her talents for the First Lady’s friends. 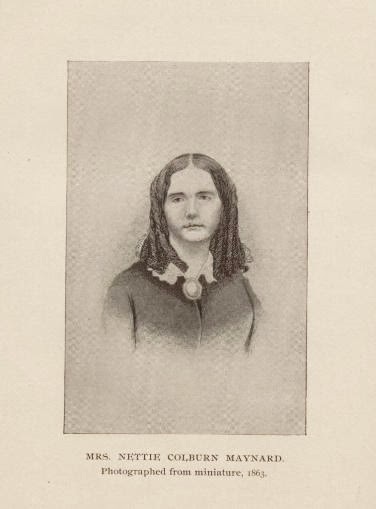 Mary Lincoln declared she had a friend she wanted Nettie to meet, but she wanted to test the medium’s powers and would not tell her who the guest was. Instead, Mary decided that Nettie’s spirit guide Pinkie should be able to guess the true identity of the mysterious guest. Naturally, according to Nettie the undefeatable Pinkie correctly guessed that the guest was a military officer who turned out to be none other than General Daniel Sickles. What made this séance stand out, besides the presence of the Union Army’s most notorious general, was that in a rare moment of bravado Nettie Colburn gave herself credit for the creation of the Freedman’s Bureau. During this séance, Nettie, speaking for the spirits, lectured the President about the condition of the freed slaves. “While the spirits realized fully the many cares resting upon the President, there was duty to perform that could not be neglected—a duty that demanded immediate attention. They counseled him in the strongest terms to prove the truth of their statements, extravagant as they seemed, by appointing a special committee, whose duty it should be to investigate the condition of these people, and to receive their report in person, and on no account to receive it second hand,” Nettie instructed. In her memoir it is clear that Nettie Colburn fully believed that the President took her message to heart. A few weeks later while visiting her parents in Hartford, New York, her father showed her a newspaper article reporting that President Lincoln was creating a commission to evaluate the condition of the freedmen. “This item confirmed what I had told my father more than a week before of my recent sitting at the White House. 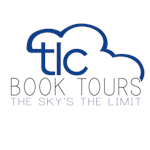 It also proved that Mr. Lincoln considered the counsel he had received through me sufficient importance to engage his attention, as he had literally followed the direction given him by the spirit world,” Maynard crowed. As the Civil War drew to the close, Nettie Colburn asserted in her memoir that she tried to warn the President that his life was in danger. During her last audience with Abraham Lincoln in February 1865 the medium again tried to voice her concern. “He turned half impatiently away and said, ‘Yes, I know. I have letters from all over the country from your kind of people—mediums, I mean—warning me against some dreadful plot against my life. But I don’t think the knife is made, or the bullet run, that will reach it. Besides, nobody wants to harm me,’” Nettie recalled Lincoln saying. The President then tried to soothe the medium, “Well, Miss Nettie, I shall live till my work is done, and no earthly power can prevent it. And then it doesn’t matter so that I am ready—and that I ever mean to be.” Nettie would never see President Lincoln again. On April 14, 1865 Abraham Lincoln was assassinated by southern sympathizer John Wilkes Booth. With the President’s death, the “Team of Mediums” disbanded. After the Civil War, Nettie married but continued to lecture and perform séances. On her deathbed in 1890 Nettie Colburn Maynard penned her memoirs Was Abraham Lincoln a Spiritualist? Or, Curious Revelations from the Life of a Trance Medium in which she recorded her experiences. Without Nettie’s memoir a valuable chapter in American history would have been lost. 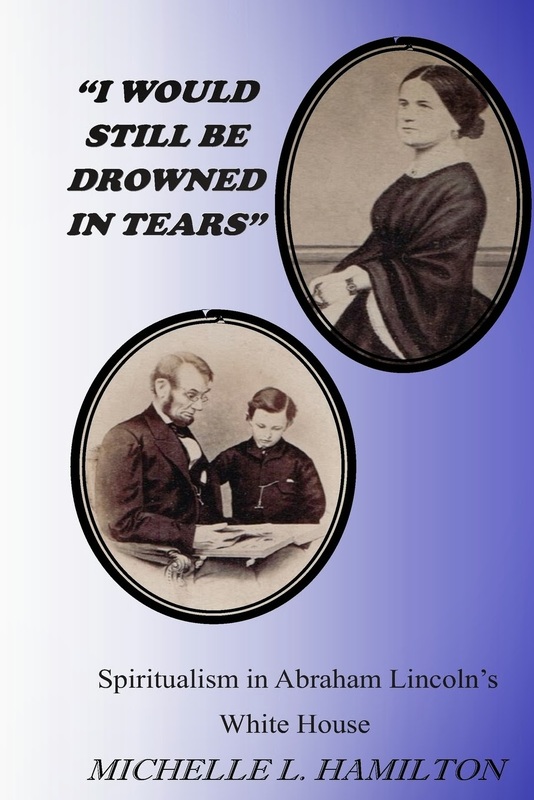 Hamilton, Michelle L. “I Would Still Be Drowned in Tears”: Spiritualism in Abraham Lincoln’s White House. 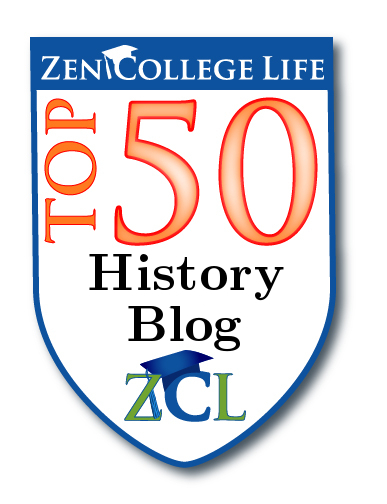 Michelle L. Hamilton is a Historian, lecturer, Civil War re-enactor and Grad Student working on her MA in History at San Diego State University. 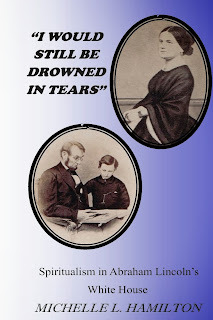 She is also the author of “I Would Still Be Drowned in Tears”: Spiritualism in Abraham Lincoln’s White House. Wonderful post full of interesting detail. Fabulous! Nettie's father is my grandfather's cousin we are all born through Mary Bishop Colborn the daughter of Edward Bishop of the Salem witch trials. Some of us are spelt Colbourne original to colburn to colborn we are one in the same.